With Spring returning, Easter won’t be far behind. It’s a wonderful holiday theme to use for homeschool resources, and Kindergarten and Worksheets and Games has a new one just for you! 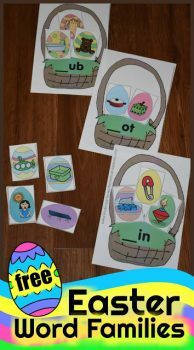 Take a look at this Easter Egg Word Families Activity! There are 14 different word family Easter baskets for your child to practice with. They will need to sort the Easter egg images into the baskets. Be sure to make sure your child knows what the image is before you begin the game! Get the Easter Word Families Activity here!